Tank WBS element is broken down into fabrication components which are the deliverable of fabrication work. See sample WBS as below. Fabrication works steps for Bottom & Roof Plate may include as minimum before sent for erection on site. 4) Inspection as per API 650 or specific client requirements. As for progress calculation, “Material Received at Shop” and “Delivery at Site” is added so as to claim the progress as part of shop fabrication. 5% progress is earned when material is received at shop as well as once fabricated materials arrived at site. Sample Work Step and Weight Factor for each fabrication step is defined as below to illustrate progress calculation. It should be discussed and agreed with Owner/Client before official progress report is issued. Inspection as per API 650 or Specific Client Requirements. Fabrication work steps and weight factor for Shell Plates are slightly different from Bottom and Roof plate fabrication as it involves rolling and circular shaping of shell plates, reinforcement pads welding for nozzles and man ways installation. Work steps and Weight factor of Tank Accessories and Fittings may include as minimum before sent for field erection at site. 1.1 Populate each component per GA drawing which is in line with WBS, for instance, each fabrication member of annular plate, sketch plate and rectangular plates are listed to track the overall progress of Tank Bottom fabrication. 1.2 Record the actual status of fabrication progress. E.g Blasting/Primer Coating Completion Date, Final Shop Inspection Completion Date, etc. This is to monitor and claim the progress of each fabrication step. 1.3 Fabrication status is calculated based on the quantity of each member, for instance, 450 kg of progress is earned out of 5320 kg once a bottom plate member delivered at site. 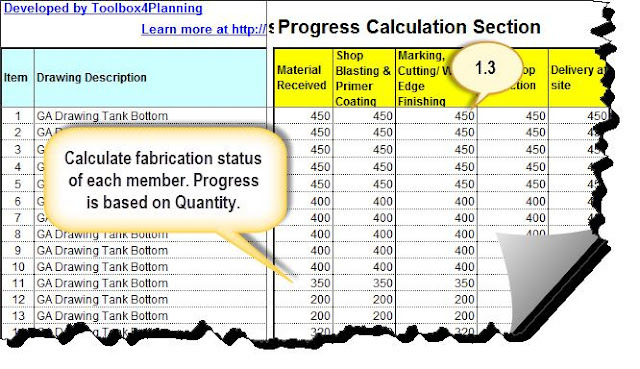 Prepare progress summary sheet that includes the total quantity of all members, overall progress of each work step. e.g 100% progress for a work step “Marking/Cutting/Weld Edge Finishing” is earned when all the members completed on that particular step. 100% progress for delivery at site for Tank Bottom fabrication is earned when all the tank bottom plates are delivered on site. Remember that progress status is measured in terms of quantity at this stage. Work steps weight factors and man hour weighting are used when physical progress is measured, for instance, 250 man hours is estimated to be spent in order to complete Tank Bottom plate fabrication prior to field construction on site. Therefore, man hour weighting (W) “0.179” is calculated against overall tank fabrication works as shown in below figure. 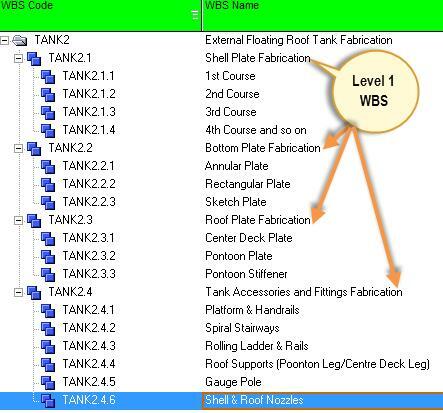 Complete the spreadsheet with Work Steps and Weight Factor for Tank Bottom & Roof Plate Fabrication as stated above. 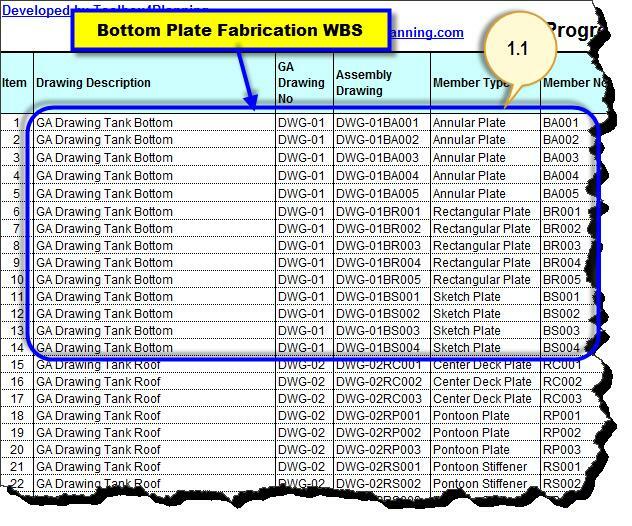 Tank Bottom Plate Fabrication = A1B+A2C+A3D+A4E+A5F, “A” is equal to Quantity Progress where linked to “Fab Status by Qty” sheet. Download the Sample Progress Calculation/Tracking System for Oil and Storage Tank Fabrication for your quick reference. I hope you enjoy it. how to calculate the man hours weighting in this example ?